Display decorative accessories that show off your individual character and the things you love with this casual rustic occasional table. 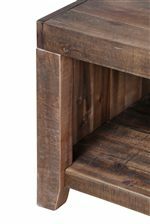 The sofa table displays simple lines that show off the distressed wood finish, a light, grayish shade popular with industrial and rustic decor styles. Table also boasts sturdy, tapered block legs and two open storage shelves. The Caitlyn Rustic Rectangular Sofa Table with Two Shelves by Magnussen Home at AHFA in the area. Product availability may vary. Contact us for the most current availability on this product. Perched proudly at the height of fashion trends, the Caitlyn collection features accents of a weathered, grayish wood finish, popular on urban industrial and rustic furniture. The Caitlyn collection is a great option if you are looking for Transitional furniture in the area. Browse other items in the Caitlyn collection from AHFA in the area.